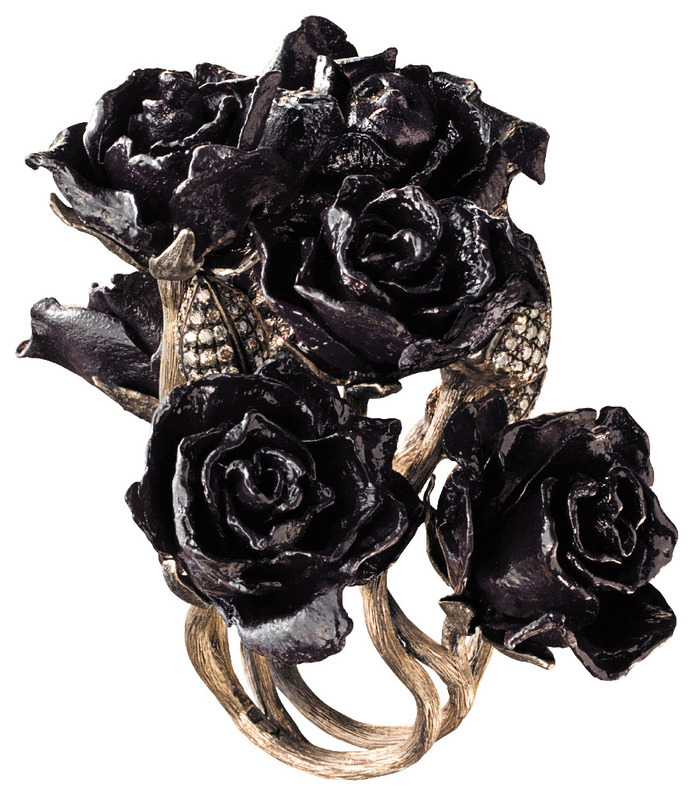 What do you get the mistress who has EVERYTHING? 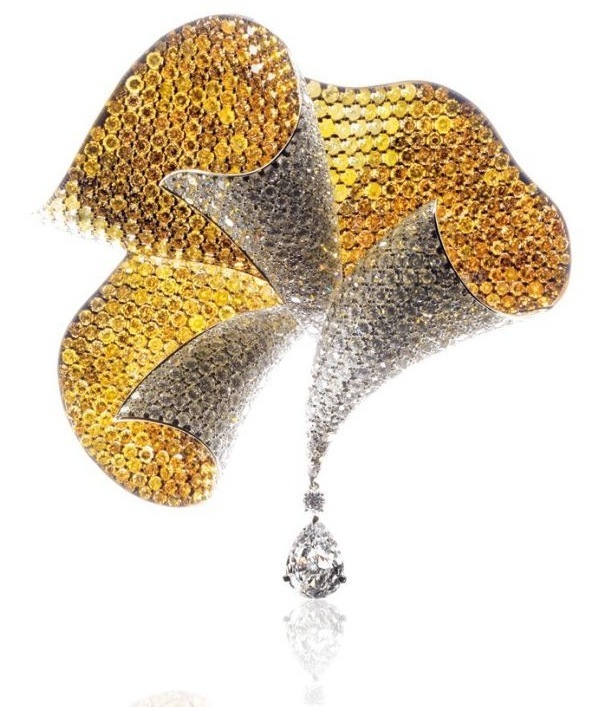 Fiocco broach, set 826 diamonds, totaling 38ct. 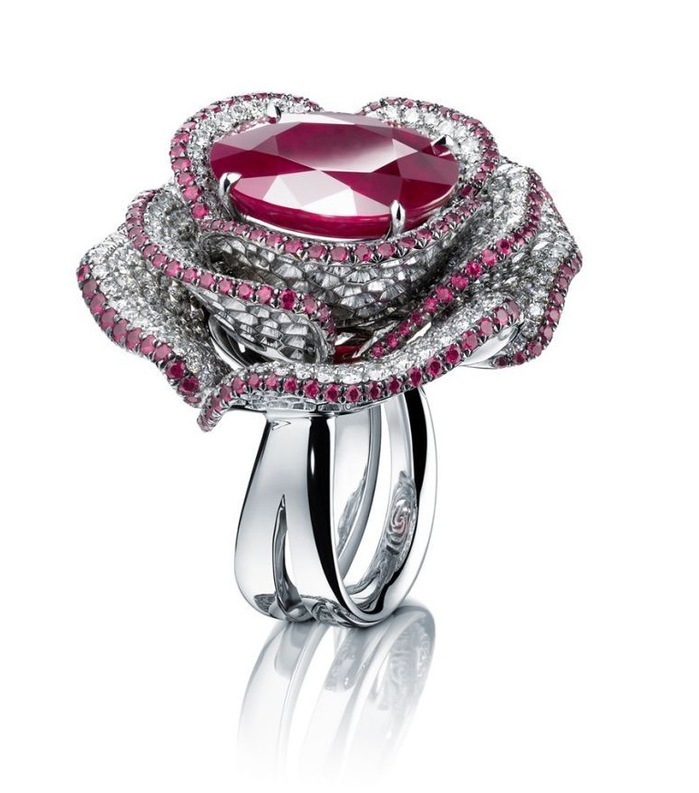 Here the Titanium was probably chosen to produce the bright fuchsia color. 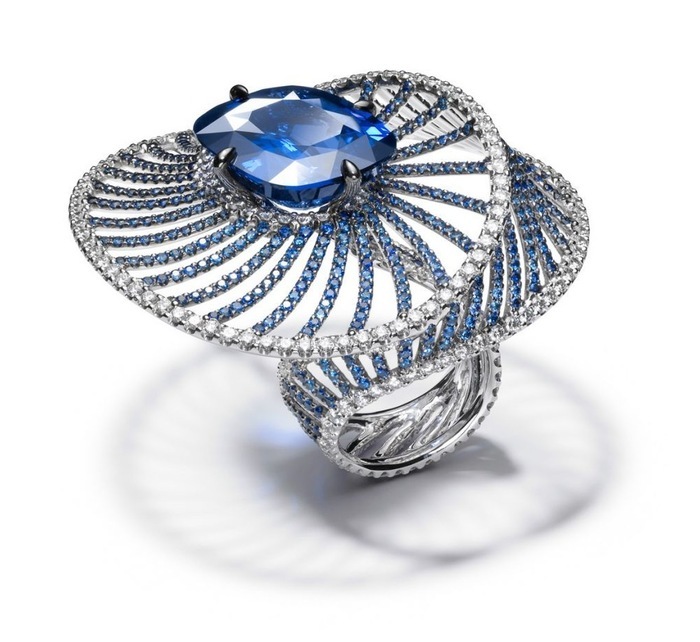 Notice how the strips of the ribbon are constructed of separate strips of metal, similar to the sapphire ring. 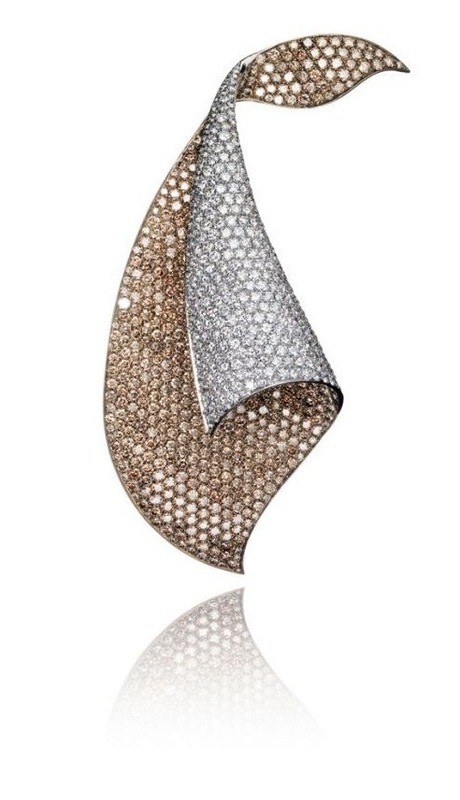 Ventaglio (Fan) broach, set with white and cognac diamonds, and a 5ct pear-shaped white diamond drop. 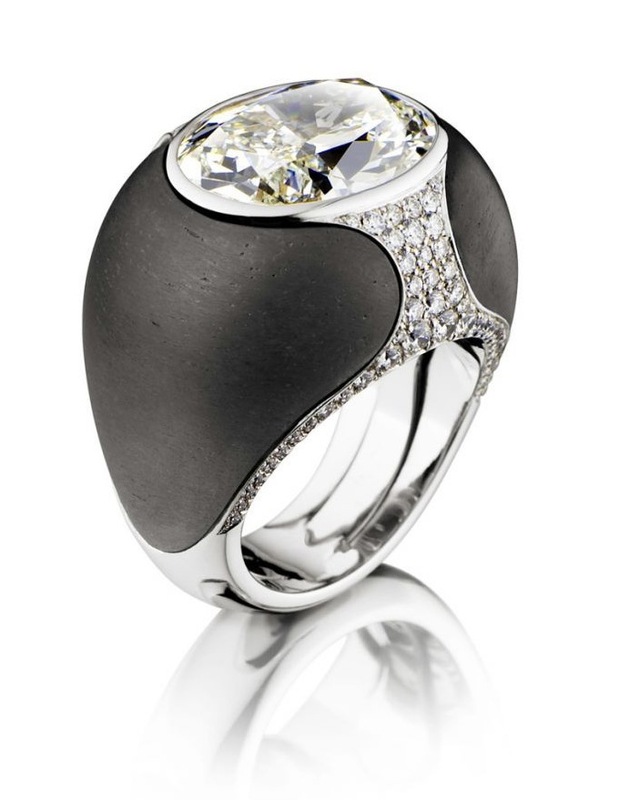 The Titanium's strength permitted less structural metal than would have been needed with Gold or Platinum, allowing the diamonds to entirely obscure the structure. 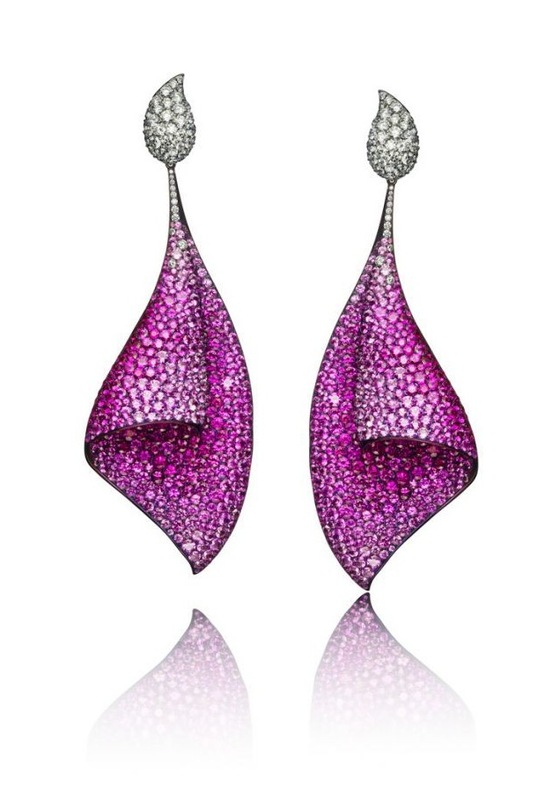 Sail earrings, set with 73ct of pink sapphires and 7ct of white diamonds. 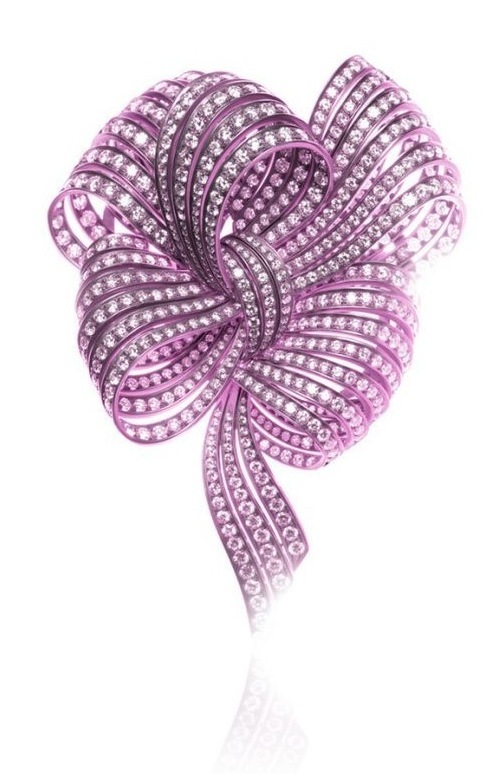 Here all of the properties of the metal are on display: it has been anodized to highlight the pink of the sapphires, no other metal could permit such a fine structure support the stones and no ear could support even that much Platinum or Gold without drooping to the floor. 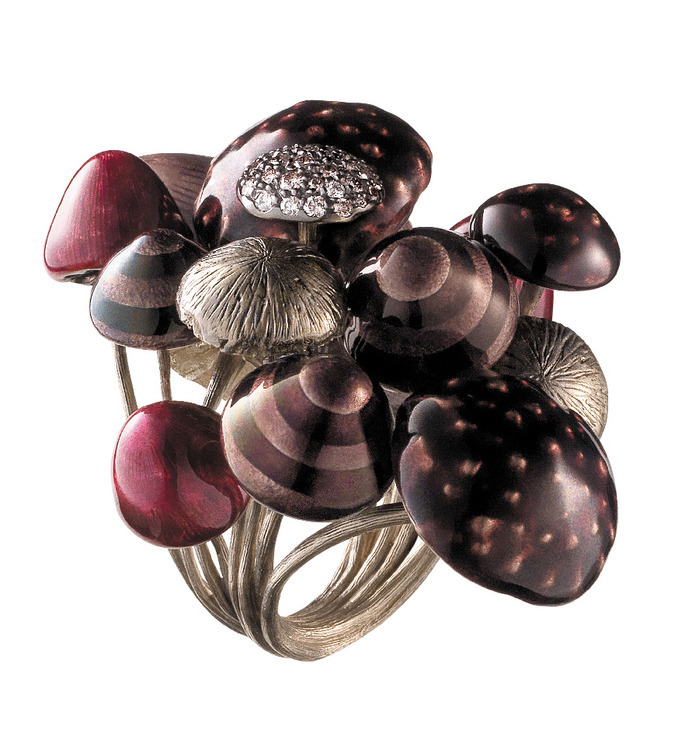 Focusing on a selection of rings for this post. 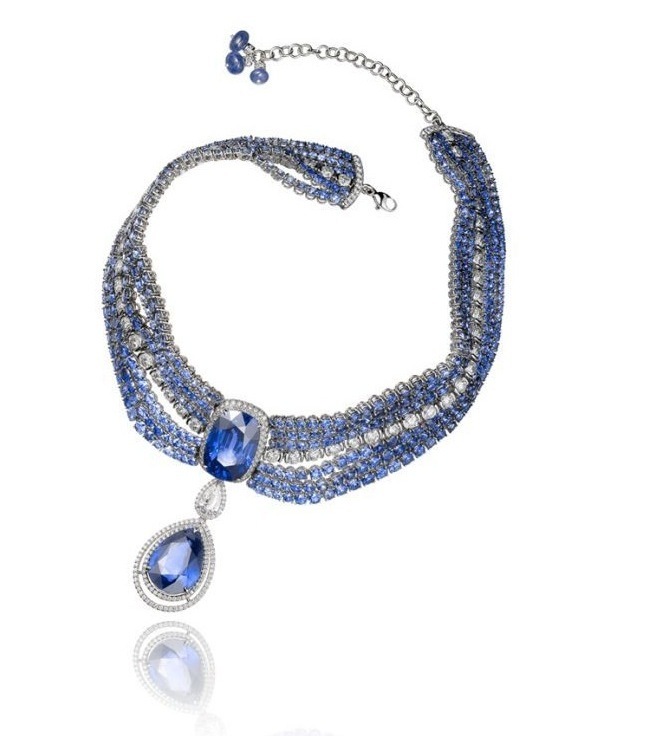 Necklaces were previously featured, and there's an unusual collection of jewelry in Titanium, where the metal has been anodized to color as part of the design, still to come. 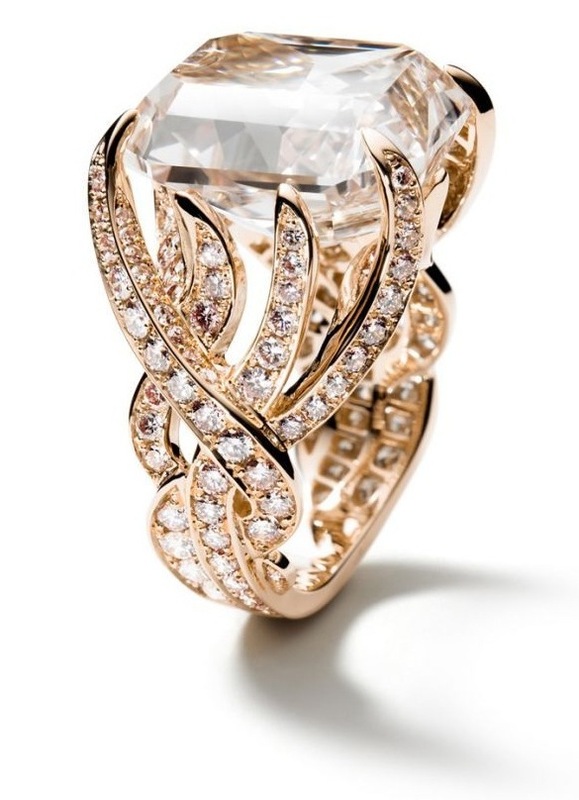 Pink Volute ring in 18kt pink gold supporting a 10ct yellow-brown diamond. 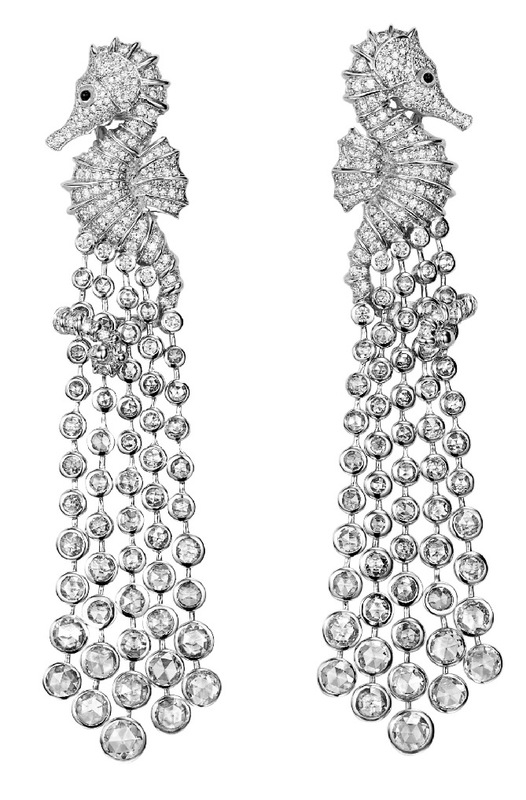 The smaller stones are Top Wesselton diamonds, an archaic European term for F/G white stones, referring to a long-closed diamond mine. 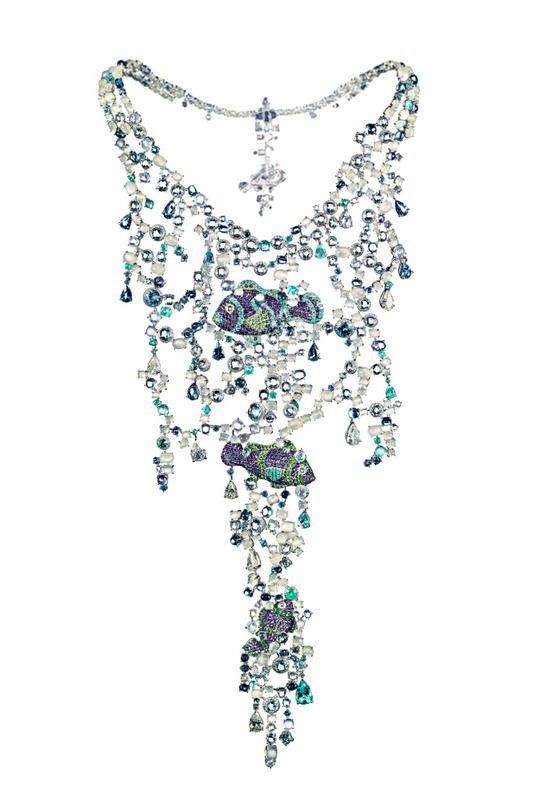 Finally an unusual piece, showcasing Adler's motif of multiple courses of stones, in this case a diamond border with tendrils of sapphire leading to the central stone. 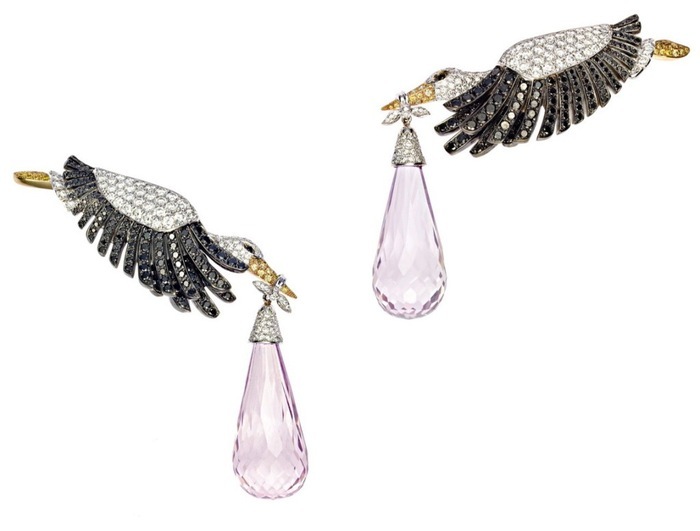 The house of Adler is one of the less well-known jewelry houses today. 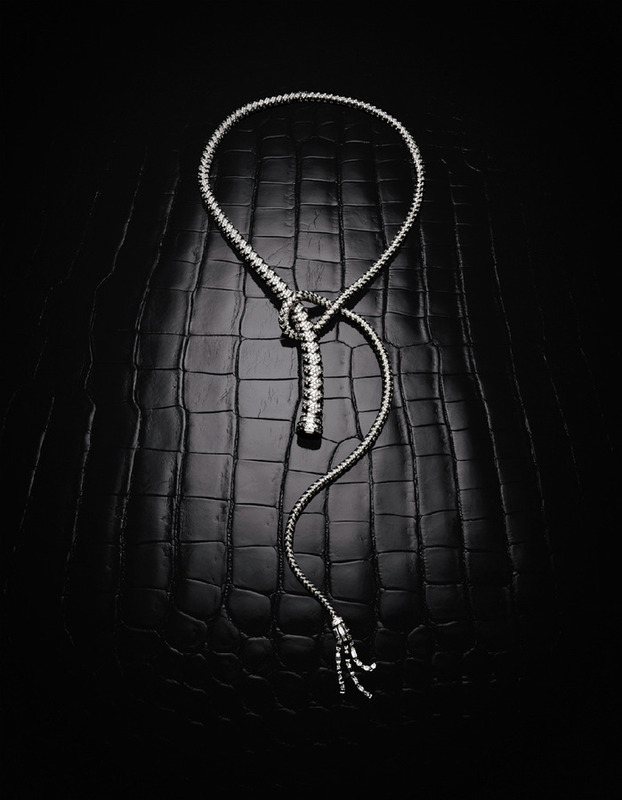 It was founded in the late 19th century in Istanbul, and moved its base of operations to Geneva in the 1970s. 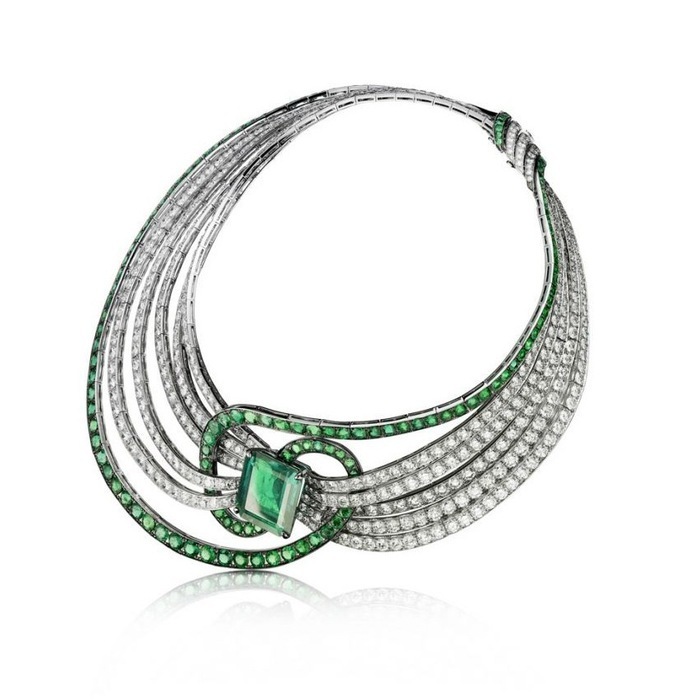 Their current collection is modern, but strongly classical in many ways. 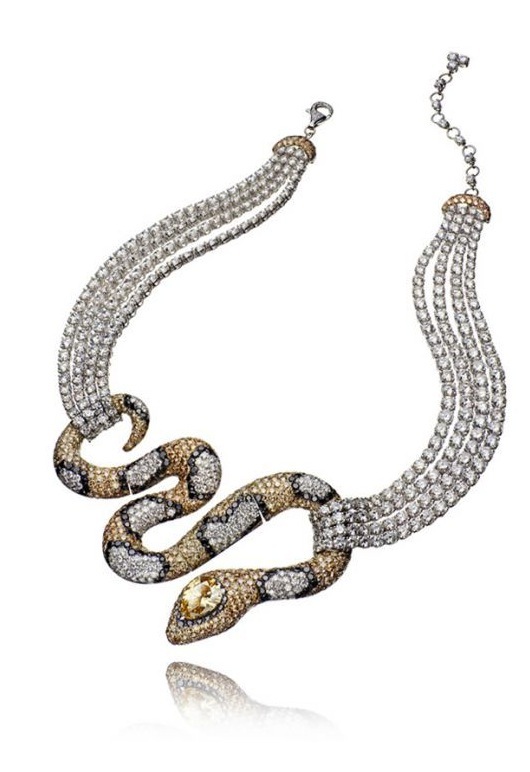 They tend to build, using multiple layers of repeated design or multiple strands in a necklaces, or multiple courses of stones. This book presents itself as a history of the Judeo-Christian view of Heaven, that is the space above the sky, whether inhabited by the souls of all the saved or just a mechanism of spheres, supporting the planets. It presents itself as spanning two worlds, "valuable for both the general audience and the specialist" (p. x), with the text aimed to be accessible to all, and the endnotes for a more scholarly sort. The organization is chronological, beginning with Sumerian and Akkadian conceptions of a tripartite universe and the Egyptian view of the heavens. 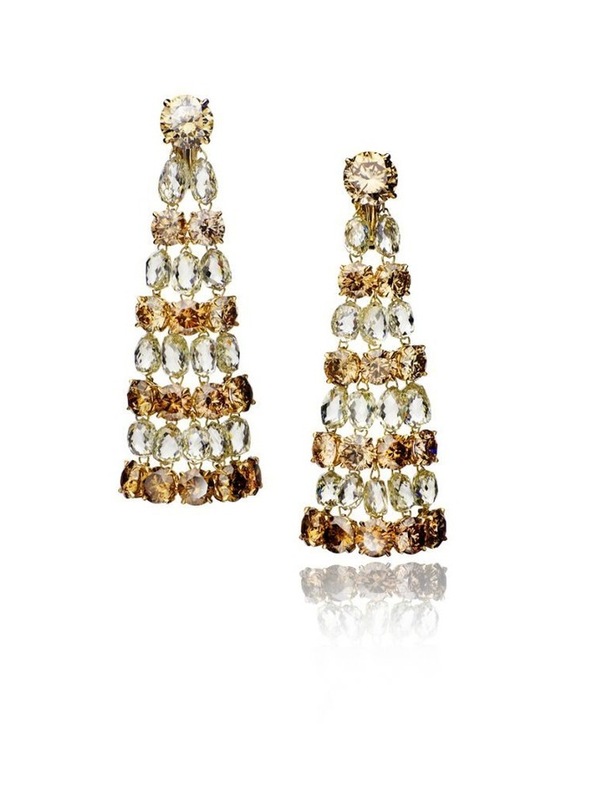 These provide a basis for the early Israelite universe, which is explained in detail. At this point one of the weaknesses of the book becomes evident, the illustrations. The bulk of the illustrations are drawings from other sources, frequently with partial captions (p. 93 for eg.). 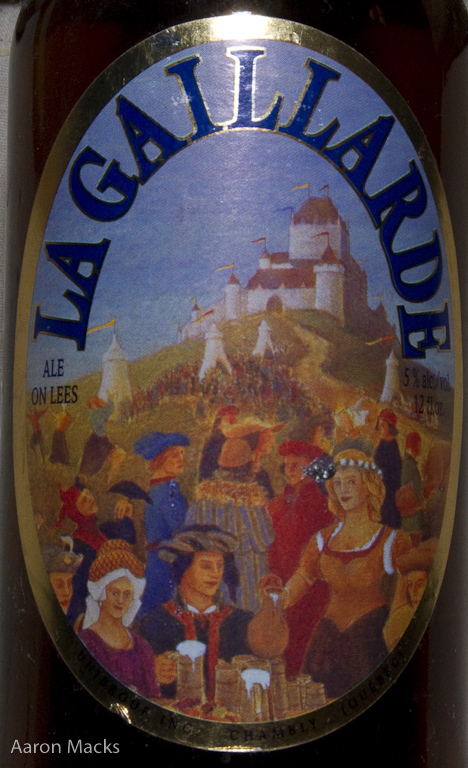 There is no unifying style and some of them, though topically accurate, are quite difficult to parse (p. 103). 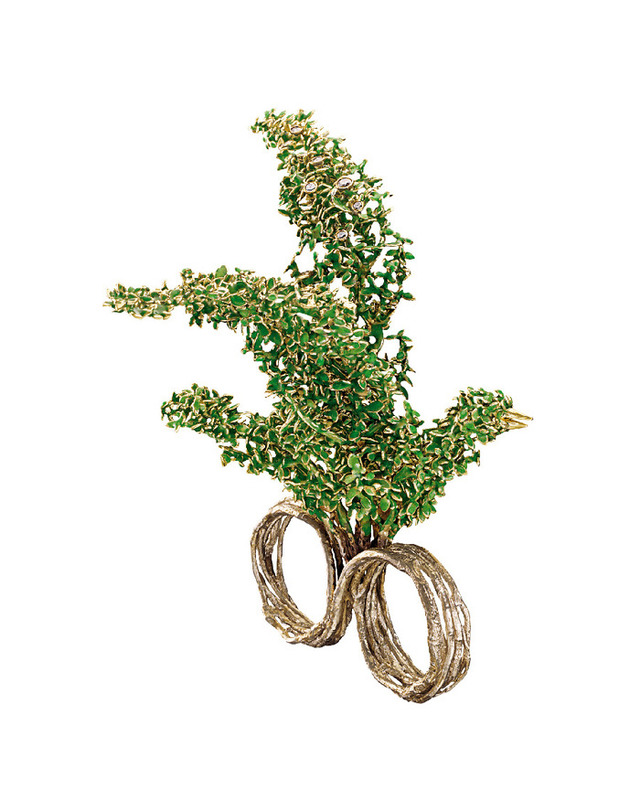 Following Egypt and Mesopotamia, we enter early Israelite tradition, which is explained quite well. The reconstruction of early Israelite semi-monotheism provides a good introduction to what can be a difficult topic and the structure of the universe, and heaven in particular as a mirror of the earthly Temple is covered. What follows is a short chapter on Greek, Roman, Persian and Ptolemaic Egyptian traditions, which are covered only in basics. There is an explanation of the various models of the universe, those of Pythagoras, Eudoxus and others, but not explanation of the bizarre elements many of these models possess: Pythagoras' "Counter-earth" or the numerous intervening spheres of later models. Finally the author's focus is reached, later Jewish and early Christian views of Heaven. He provides some excellent examples from some of the more complex Apocryphal works beginning with those which stuck with a "single heaven" cosmology, and then those later works which adopted the Greco-Roman multiple-Heaven view. The texts are complex, but the explanations are quite well constructed, and make the concepts as clear as possible, given the oddities of some of the texts. It is in these texts that the concepts of human "souls" ascending into heaven post-mortem gains popularity, as well as the entrance requirements for those souls: good works, charity, and the most popular, orthodoxy beliefs that agree with the author. In conclusion, I'd recommend the book. 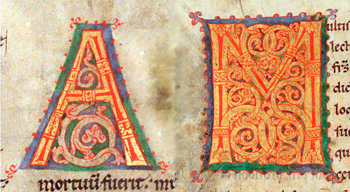 There are some weaknesses in the "general audience" accessability, including some passages in ancient Greek and some common scholarly techniques for transliteration, which the non-scholarly audience might not follow. 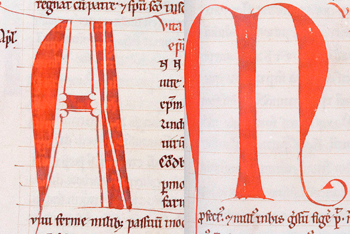 That and the, previously mentioned, uneven quality of the illustrations would be the only major problems. Using a programming toolkit called Processing Peter Blaškovič has created a collection of little interactive toys based on novel interpretations of basic physics, like particle interactions. 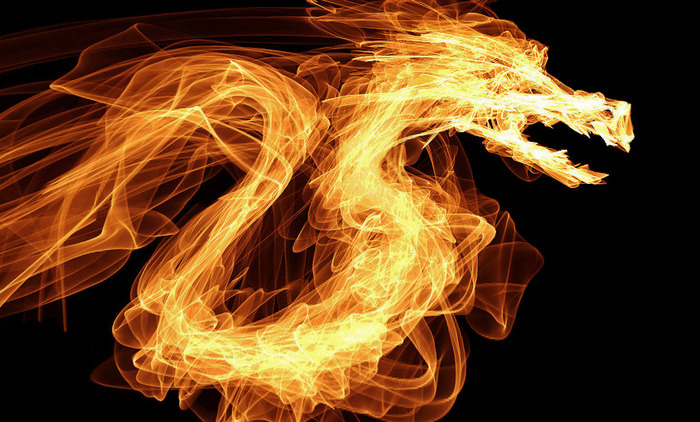 One of the newest ones, Flame allows on to simulate, quite well the sort of long exposure work that Julien Breton (previously referenced) does in reality. 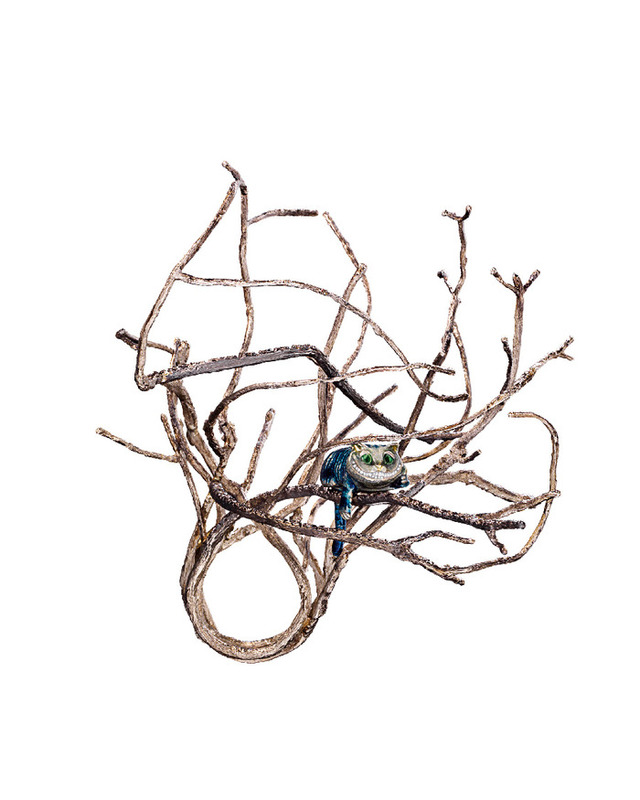 Sadly the image export function is broken on the Macintosh, but I was able to capture a sample of my work via screenshot and borrowed a sample of Peter's work from the gallery. 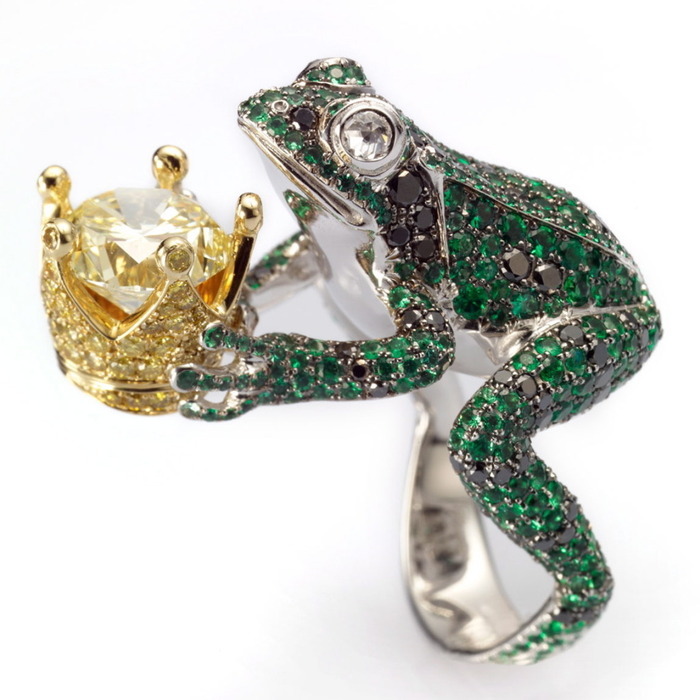 Famed Brazilian jeweler H.Stern has produced 5 rings, in partnership with Disney, inspired by the recent Alice in Wonderland film. 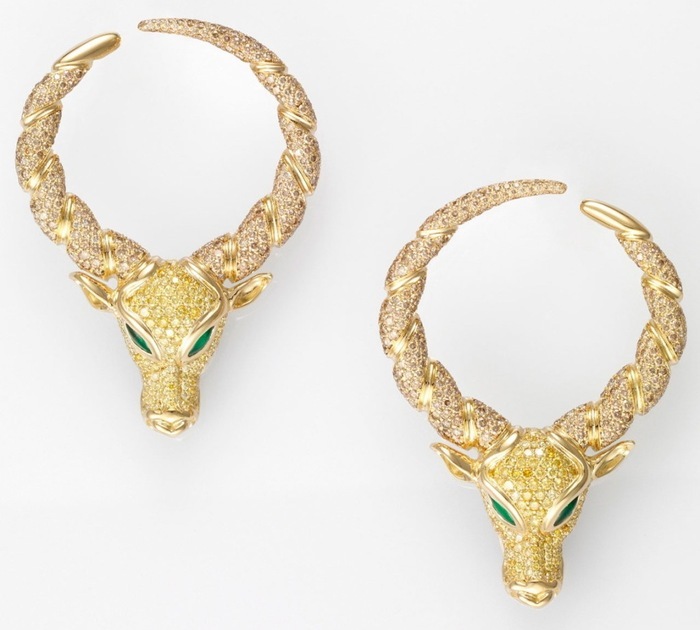 All are in yellow gold with enamel and occasionally diamond accents. 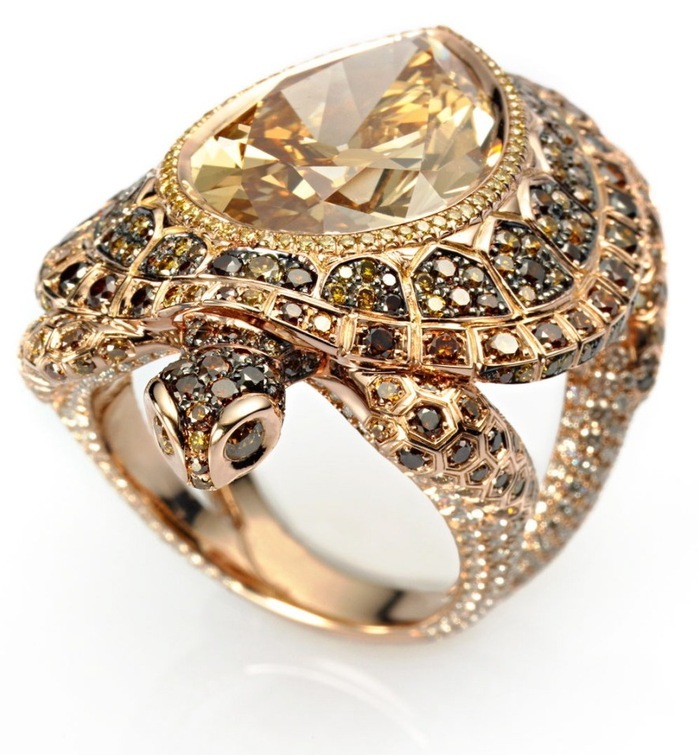 The fifth ring is the Jabberwocky, but I have yet to find a good picture of it. 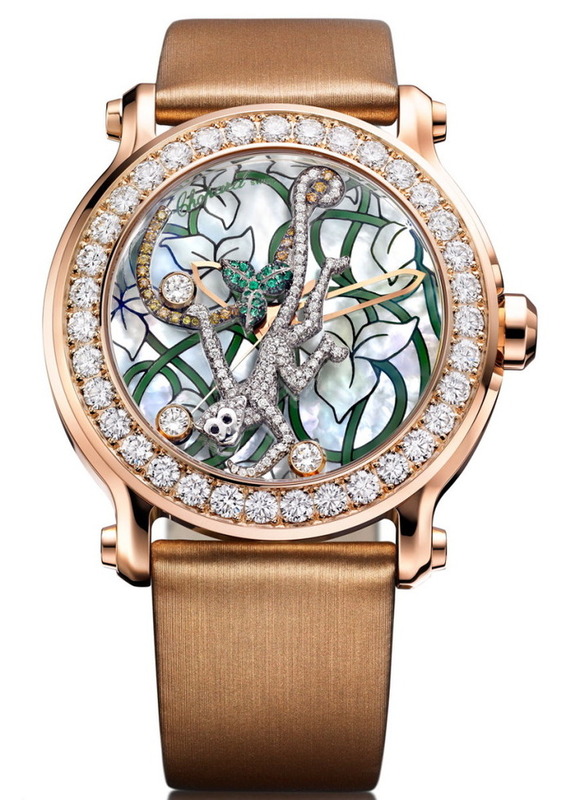 As part of their 150th birthday, Chopard has release a animal-themed watch collection alongside the jewelry, previously mentioned; All three of these pieces are within the "Happy Diamonds" collection, so the small round diamonds on the dial are actually mobile, free to bounce around the face of the watch. 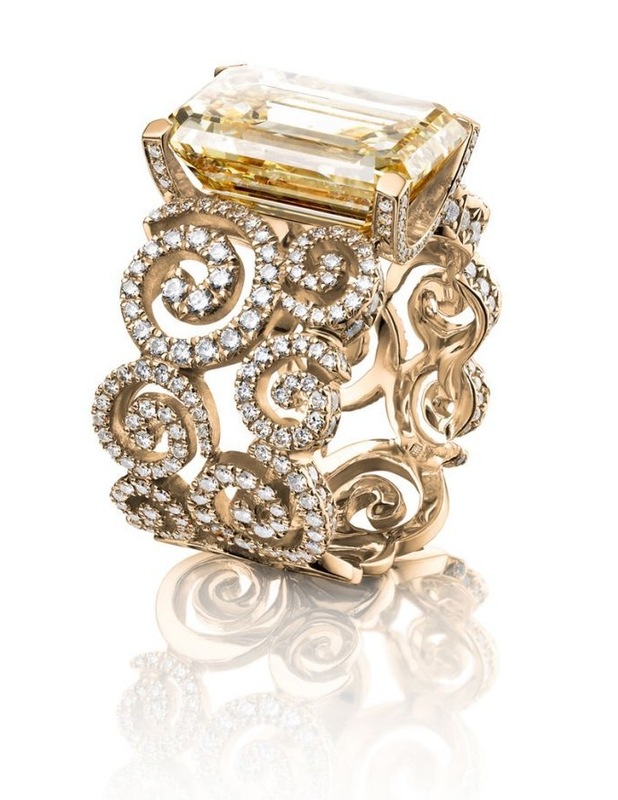 All are quartz (sigh) movement, in 18kt gold cases with white diamonds set in the bezel. 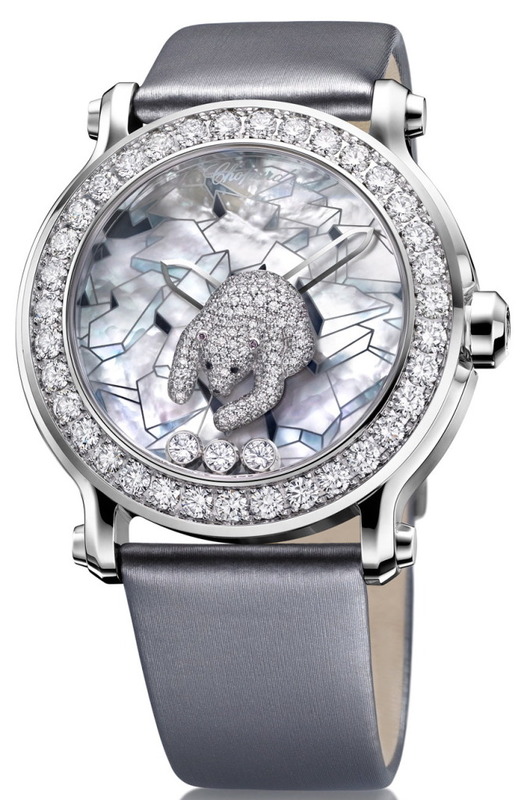 The dials are painted mother-of-pearl. 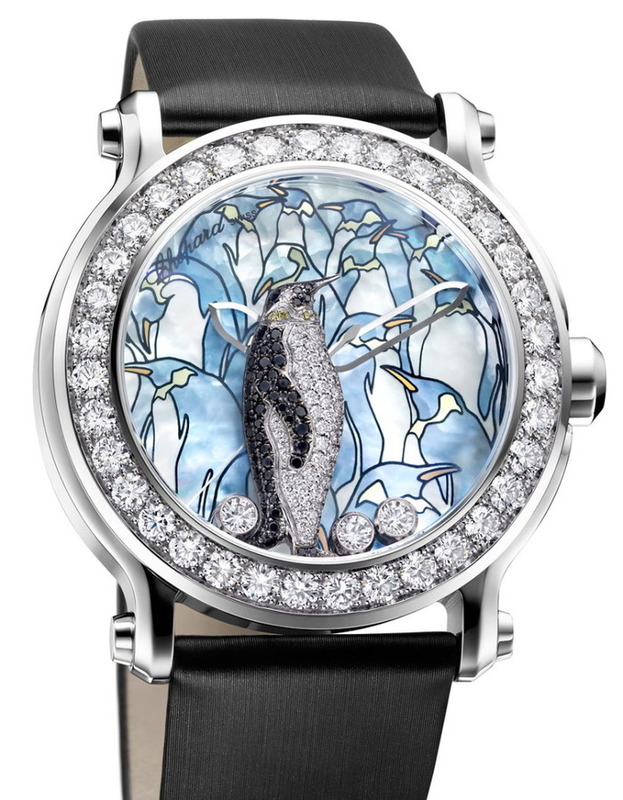 First is the penguin, set with white, black and yellow diamonds. The dial has the rest of his flock as a background. 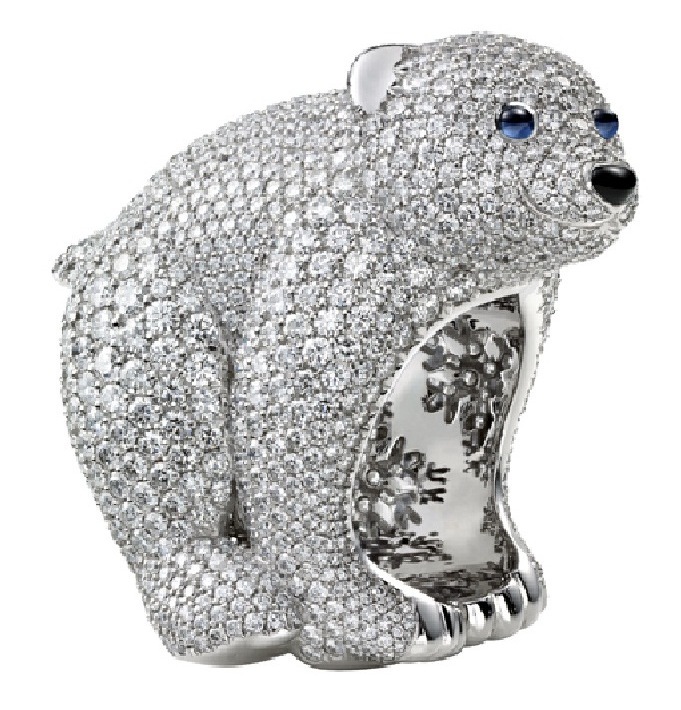 A polar bear follows, in white gold set entirely in white diamonds except for onyx eyes over a painted ice floe. 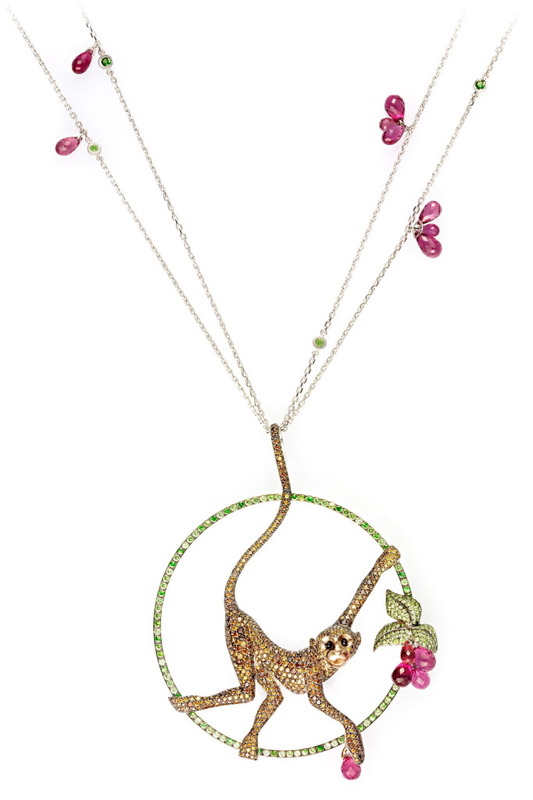 Finally a monkey, in white gold set with white diamonds, climbing on a yellow-diamond set branch passes a green leaf. 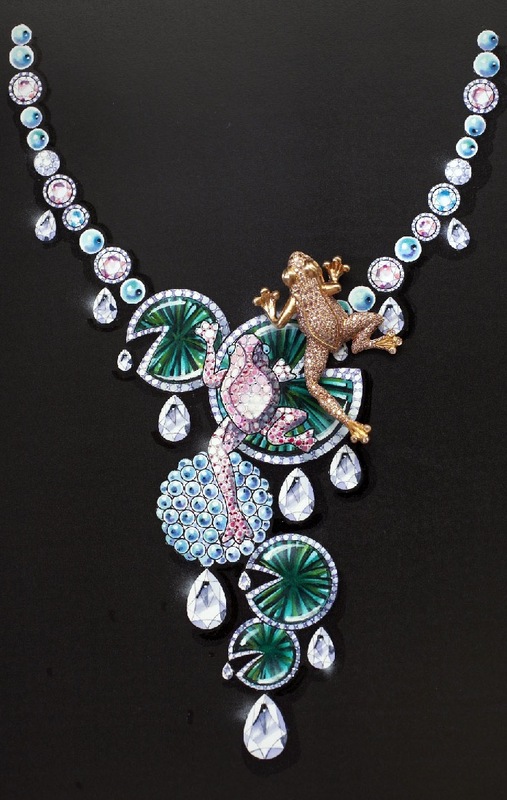 In this one the branch and the monkey separate the three mobile diamonds, each cannot leave its allotted third. 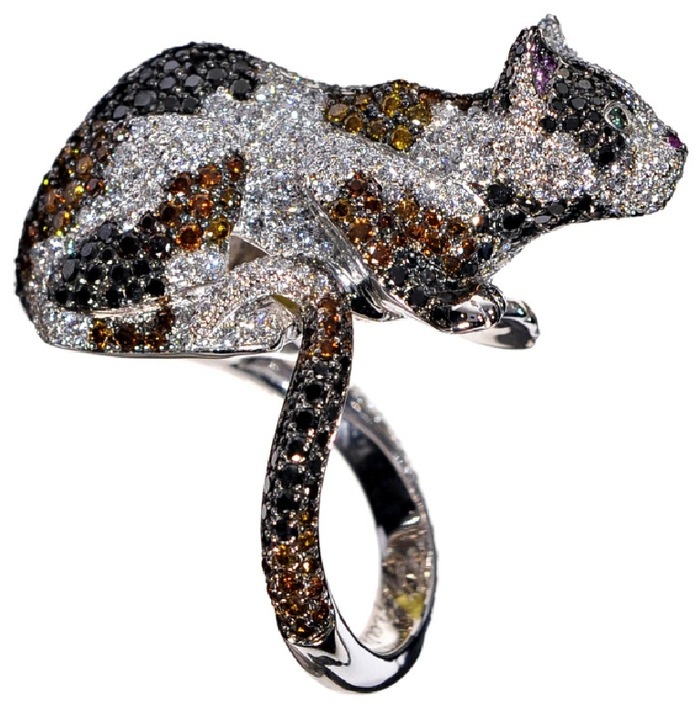 Bear ring in white-gold, pave set with diamonds and set with sapphire eyes and a onyx nose. 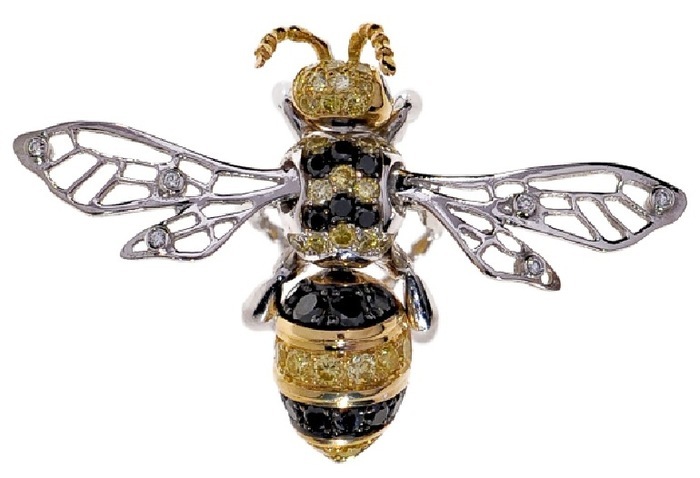 Broach in the form of a bee, yellow and white gold set with black and yellow diamonds. 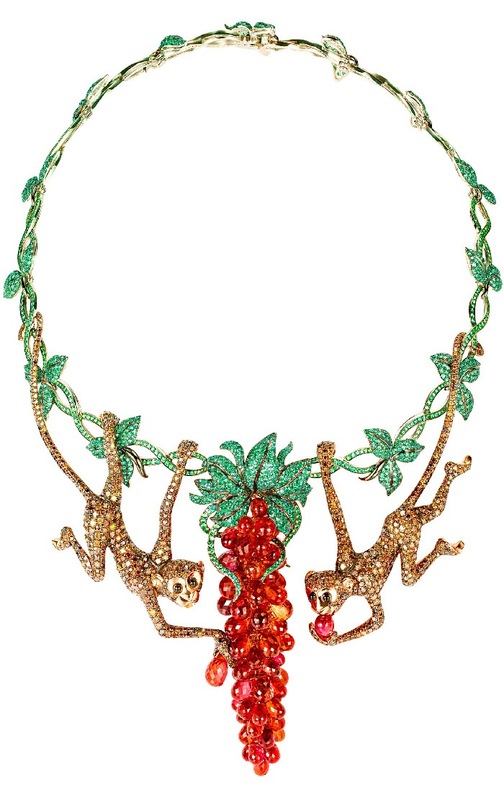 Necklace with a pair of monkeys in white and yellow gold, set with emeralds, sapphires, tsavorites, onyx and brown diamonds. 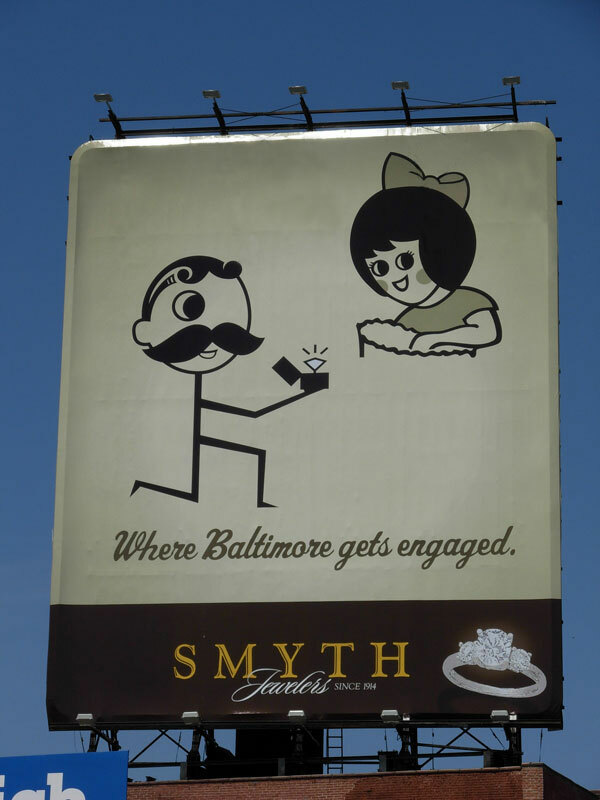 For those ignorant of the lore of Charm City, that's Mr. Boh, of National Bohemian beer fame, proposing to the Utz Girl, hawker of Utz potato chips.